Modernise your natural grin with the addition of porcelain or composite veneers. Using a very thin custom-made shell over the front of the tooth, veneers are designed to cover the natural tooth surface and boost the visual appearance. The veneer is crafted out of porcelain or composite resin materials which are cemented over the tooth after removing a layer of your natural enamel. Why would I want Veneers? If you choose to go with porcelain veneers – the model will be forwarded to a laboratory where an exclusive set of porcelain shells are fabricated to suit your natural teeth. If you choose to go with composite veneers – your replacements can be set in a single appointment. Before placing the veneer, your dentist will remove a small amount of your tooth. This way there’s enough room to fit the veneer over the front of the tooth without any noticeable bulking added to the front of your teeth. Once your dentist is satisfied with the amount of enamel removed, the veneers well be set over the teeth to replace the removed layer. Veneers take on a natural look and can even resist staining. They effortlessly enhance the beauty and shine of your teeth, often wholly improving the shape of your smile and in turn offer a boost for your self-esteem and confidence. 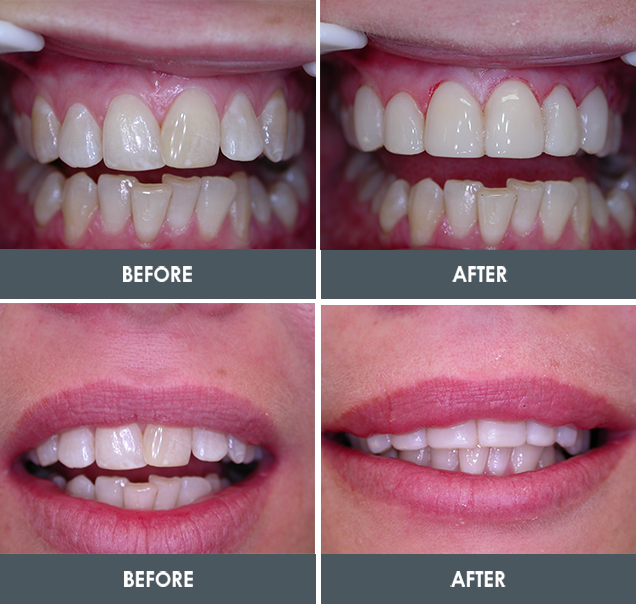 Take a look at these before and after images to really grasp the breathtaking results veneers can have for you.